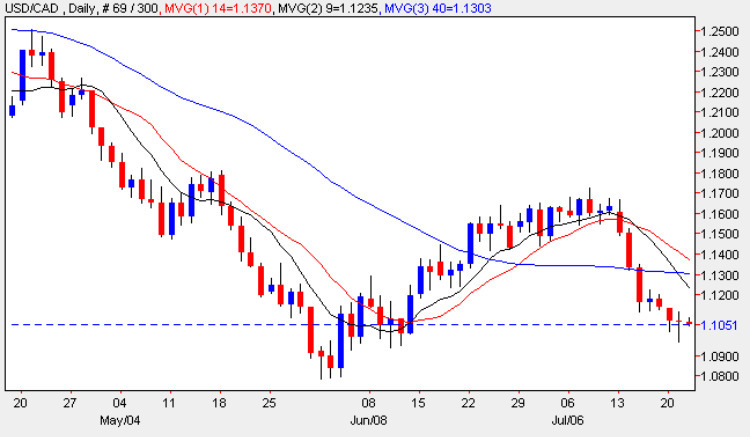 Yesterday’s bullish hammer candle on the daily usd to cad chart, may be the signal for a short term reversal higher, following the sharp sell off in the pair in the last few days, but as always we need to wait for this signal to be confirmed in due course. From a technical perspective it is interesting to note that the low of the day found support at previous interim support level created in early June, where four tests at this price handle were subsequently followed by a strong move higher. Whilst I am not suggesting that this may happen here, it is certainly interesting that the move lower has stalled here once again, and we now need to be careful in placing further short trades until this signal is either confirmed with a move higher, or alternatively ignored as we continue lower. With all three moving averages pointing sharply lower, and with the 9 day having crossed the 40 day moving average, this seems the more likely at present. Following the sharp sell off in the US dollar, we could see a pause point here, particularly following the rate decision yesterday from the BOC, followed by Bernanke’s testimony which continues in the US later today. In addition, we are now waiting for the Core Retail Sales and Retail Sales figures for Canada, both of which are ‘red flag’ items of fundamental news on the economic calendar, which are forecast at 0.4% and 0.5% respectively. Finally we have the oil inventory numbers from the EIA which although released as a US data set, tend to have more impact on the Loonie, due to the country’s status as a large oil producer in the global market.